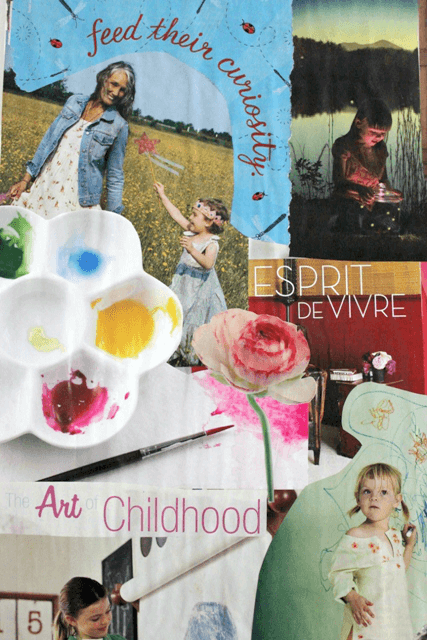 These vision board examples use magazine pictures, photos, and words in collage form to achieve goals and reach intentions. You know I’m a visual person, right? Images hold a tremendous amount of power for me. I like words, too, but they flow in and out of my head without catching hold quite the way that images do. I’ve told you that I plan my life with 3×5 index cards, and that’s true, but I also plan my life through collage. I assemble images and words that speak to me (mostly cut from old magazines) into a visual reminder of what I’m about and what I want to focus on. In other words, I make a vision board for myself. I’ve also heard these called dream boards, goal boards, and inspiration boards. But I call them vision boards. I usually do this around the New Year and possibly again at some point if I’m feeling the need to readdress my values and goals (or just want to play around with pictures, scissors, and glue). I’ve always been a little embarrassed by this and haven’t exactly advertised this habit of mine. My friends might see one of my life collages hanging up, but I don’t tend to talk about them. Just like I wouldn’t necessarily share a private journal entry. But maybe I’m changing. I don’t know. Maybe I’m maturing enough that I can bare myself a bit and not get too embarrassed. Anyway, I just came across a stack of old life collages or vision boards that I didn’t realize I had kept. Collages that go back six years or so. Amazed at the themes that continued from collage to collage. Amazed at how much the images and words that I chose and arranged years ago still resonate with me now. And I got so excited that I hung a whole wall full of them in the office! Six full-sized poster board collages of dreams, ideas, and intentions all snuggled up together above my sewing desk. It’s making me so happy right now and I thought I’d share a few snapshots with you. And, yes, vision boards work. I’ve written a book, taught art, gardened with my kids, and more. I’m wondering if any of you do something similar. 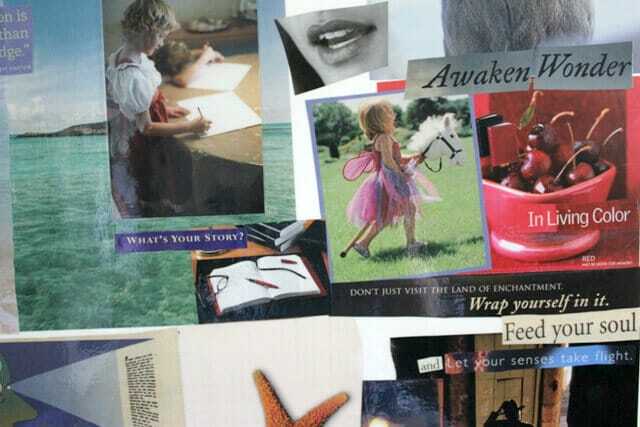 Do you make life collages, vision boards, or goal boards? so funny to be reading this post today….I am taking a break from collecting pictures for my first ever vision board! I think you included a photo of one in my interview. Lately, I haven’t had time for collaging, but I love cutting and collecting the images. I find it very soothing. Yes I have … I have kept some of my images in scrapbooks or in a folder but I am now thinking about displaying some them ( old and new) . Thank you for your inspiration. I put words all over the bathroom mirror. I find quotes that resonate and on the mirror it goes. Sometimes it is so full you can barely see the image of yourself as the words are all over. I also gather lots of pictures from the internet. Things I love. Been trying to figure out where to assemble them. Thinking about decopage on a chair with them or something! I’ve been loving Pinterest for a virtual version of this lately. I don’t get magazines now the way I used to, though I used to do exactly this a lot. I started in high school. I’ll still break out in collage occasionally, but it’s more likely to be “art” than “inspiration” (the lines do blend, however). I’ve seen this called a specific name–treasure mapping, maybe? one of the libraries here had a workshop–but I don’t think the treasure mapping people invented the process. ;) It’s not something I do (and I can’t see myself EVER doing it in a group at the library!) but I tend to be a words-and-list sort of person. I think that hanging up anything that inspires us, right where we can see it, is a great idea. Thank you so much for sharing this part of yourself, I love your collages! I am inspired to do one of my own. Like Aimee says, I don’t get as many magazines as I used to, but I think I can find some good candidates! I used to do collages like this all the time as a young adult, but fell out of the habit. This is so amazing. I have a wall too, the one I have my desk against, but I use more white space so I guess that doesn’t quilify as a collage but it is inpiration all the same. Love it! I’ve always cut things out of magazines but they somehow end up filed away and then I come across them later. I should really just glue them all together like you do! Thanks for sharing. I do love pasting things into my journal and day planner – but this post reminds me most of my biz. partner, Ashley. She does amazing collages on the back of her bedroom door each year or so, and right before she takes an old one down – I stare in wonder at how much her life now resembles the board that she put up so long ago. I should tell her to photograph them! Wow… beautiful! Thanks for posting about this. We are about to move cross-country (to NC!) and I’m trying to look at it as an opportunity to be more intentional in how we craft our home and lives. This is exactly the kind of activity I need to help bring my ideas to life. Somewhere between setting up garage sales, planning a birthday/farewell party, and keeping the kids out of the “big” tree, I will be snipping magazine photos and locating my glue stick! Wonderful! I used to do something very similar when I was at University- my whole bedroom wall was plastered in art postcards, photos, fonts ad graphics! It must be a visual learner thing? Although I don’t have anything like it now mainly due to lack of space and hubby hating clutter. Maybe when I get my own craft/ art space I can do this again. Thanks for the lovely post and letting us glimpse into your life! How wonderful! I did an entire wall of collage in my room in high school, and it was such a fun challenge and ongoing inspiration. i love vision boards! i used to do them on new year’s eve for the year ahead, and i invite my art therapy clients to create them at times, as well. yours are lovely! i’m so glad you shared – it’s inspiring me to begin again… though right now it seems like pinterest is serving as my virtual vision board – eek! I belong to a gluebooking group on YahooGroups, and that’s what your vision board reminded me of – a gluebook on a larger scale! I love using vision boards in my home office. Another thing that my children and I like to do is a “Gratitude” board. We collect pictures, words and drawings that remind us of things we are grateful for and create a collage of the things we love about about our lives. My teenage children have even written notes of gratitude to each other on the board. Visiting Friends and Family are invited to write or draw when they come over. It is constantly changing and is a beautiful reminder of all the blessings we have in our lives. Your boards are beautiful Jean! Thank you so much for sharing! Thank you for sharing this Jean! they are absolutely gorgeous and an inspiration I have been looking for! I have been toying with the thought of doing some collages but had no ultimate idea of what I wanted to do. I’m a strong believer in attracting what you want to you (do a search for The Secret on Youtube/google if you don’t know what I mean) and your collages really clicked with me. I used to do this a lot, and I even did collages like this for characters and stories I’d write. Haven’t done it in ages, and I think it’s just what I need for a little visual kickstart right about now! 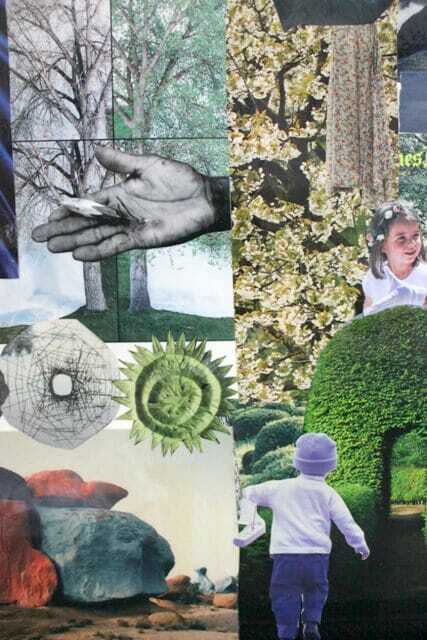 I’ve also been considering adding images and smaller collages to a journal. Thanks for sharing, they’re really beautiful! I do a sort of “rolling” vision board- i use pins on a corkboard to create a vision board of what inspires me, then I revisit and change things/add things when it feels right. I like that it’s a living thing, changing as I do. I also really like Pinterest as an online visual journal. I love your blog, thanks for sharing again!!! My mother once made a realy large collage of our family photos as a birthday present to my dad (that included photos of our grand parents, and great grand parents, and old black-and white photos as well, and then photos when my mother was pregnant, and when my brother and I were born, and so on and so on…) They still have it in their house. That’s one of my favourite objects in that house, and we all love it. We can spend so much time watching and ‘travelling’ through it. A beautiful thing! I used to make collages in my young adult life but haven’t found the time until now. You’ve inspired me to start again but this time I’ll be collaging with our daughter who loves to cut abd glue! Thanks for the inspiration! it’s so funny that you posted this because i just recently did a little collage just like this too! i used to do the same thing when i was younger and i thought trying to make one again now might help me focus my thoughts and desires. i was a little embarrassed to make it too but i think it felt good to remind myself of what was important. I have a “manifestation board” (which is a shadow box frame with a cushy fabric back). I pin photos and words of things that I’d like to manifest in my life. It’s really amazing how they almost always come true! I love to create collages! I ramble through magazines and cut out anything that ‘speaks’ to me, glue the images together and voila! A representation of this time in my life journey. I like to revisit collages from the past. They speak so much to me, more than I could ever express in words and with a quick glance. A great way to ‘dig deep into the soul and explode’. I enjoy your blog immensely! From Canada — mother of two and fellow creator. Thanks for all you share! Thank you! You’ve just made me remember that i love to collage. I haven’t really done it since university where my whole room was a collage of magazine cut outs that spoke to me. I went on to be a full time accountant and mum. I just finally created a large semi inspired bulletin board in my new home office and I have many unfufilled (but I’m trying) art, creative objectives for my kids. Anywhoo, you just set off a lightbulb for me. I do! LOVE to collage inspiring images. Thank you. I’m going to do more of it..just for me. i use the fridge door… all family art is welcomed. i put a few A3 pieces on the door and cover them with contact so they double as message boards. right now we have a renaissance door in graphite and horses in watercolour. sometimes it goes 3D with rocks and found things glued to magnets and stuck to the fridge.